A published report claims that the first range of Windows 8 tablets will hit store shelves in November. The tablets will come in at least a dozen varieties, claims the source, with more than half of those being hybrids or convertibles that combine elements of laptops and tablets, often including physical keyboards. But all the Windows 8 tablets will have two things in common: they'll run on a version of Microsoft's Windows 8 operating system, and they'll be powered by Intel's upcoming Clover Trail dual-core processor. If this Windows 8 tablet rumor proves accurate then Windows 8 will be released either before or alongside the new devices in November. That time frame is in line with current rumors regarding Windows 8's release, which state that Microsoft's new OS will be released commercially in the second half of this year. "The schedule is tight," said CNET's source. We got a peek at Windows 8 released in March, and TechRadar deemed it an improvement over the previous Developer Preview but there's still work to be done on the OS. Previous reports point to the many features Intel's new line of Windows 8 tablets will pack, including 4G, NFC technology, lightweight designs and great battery life. Other rumors claim that Microsoft will release as many as 30 Windows 8 tablets by the end of the year in an attempt to whittle down the iPad's lion's share of the tablet market. The Windows 8 tablets will be powered by Intel's upcoming Clover Trail Atom chip, their first dual-core Atom processor based on 32-nanometer technology. Additionally, Intel's follow-up to the Clover Trail will be called "Bay Trail" and will be built on superior 22-nanometer tech, according to the published report. Intel confirmed to TechRadar in an email that Bay Trail is indeed the successor to Clover Trail and is slated to arrive in 2013. 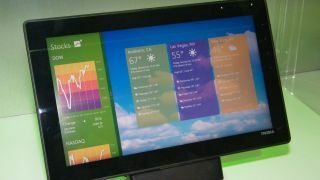 TechRadar approached Microsoft about rolling out new Windows 8 Tablets, but a spokesperson declined to comment on the rumors.